Today was a good day. A very good day. Especially for those following social media and hearing the heart-tugging story of Miles Scott, a 5-year old from Northern California who has been battling with leukemia for the last three years. 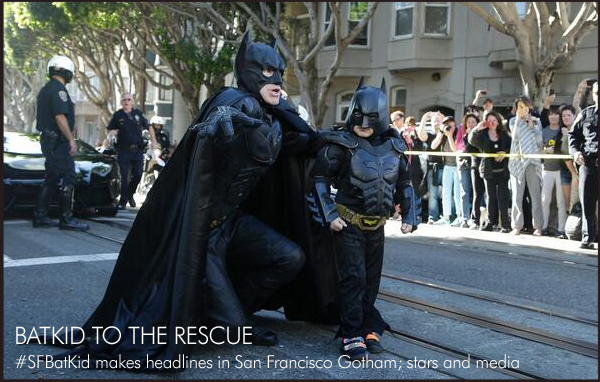 On this special day, the Make-a-Wish Foundation and the good people of San Francisco turned this 5-year old’s comic book fantasy into reality. 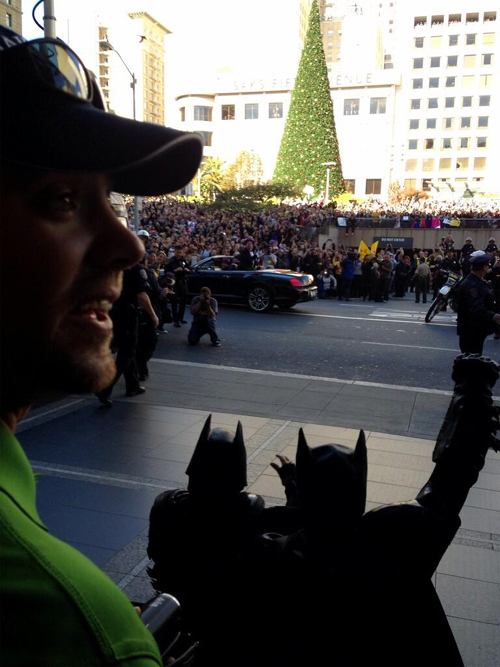 Suited up as “Batkid,” Scott rushed across the converted Gotham to put “bad guys” behind bars. 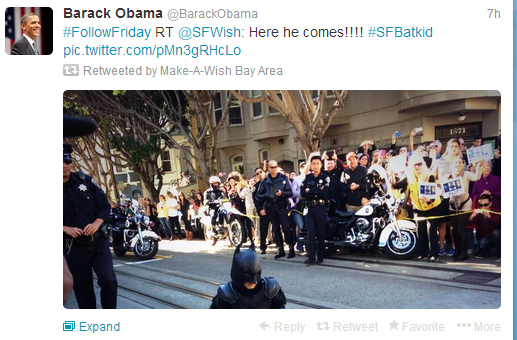 The news about “Batkid” made national headlines, even picking up a friendly endorsement from WaPo’s Jonathan Capehart, who wrote “perhaps a melt-your-heart superhero can get things going in Washington again.” Even President Barack Obama chatted about the #BatKid on his Twitter page today. 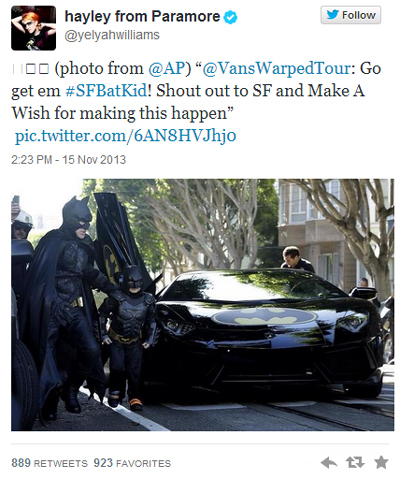 There was more action in this caped crusade, as “Batman” and “Batkid” rushed across the city in two Dark Knight-decorated Lamborghini vehicles with accompanying police officers escorting them the whole way. They headed to lunch at Union Square for burgers atop Macy’s. Afterwards, the Dynamic Duo saved a damsel in distress tied to a Riddler box on the cable car tracks. They also disarmed a box prop, imagined to be a fake bomb. Later on, they stopped The Riddler at a staged bank robbery before beating up The Penguin, who had kidnapped the San Francisco Giant’s mascot Lou Seal. The 5-year-old at first seemed overwhelmed by the outpouring, quietly working through each scenario with clenched fists and tight lips amid delirious chants of “bat kid, bat kid.” But by the time he reached City Hall to receive a key to the city in front of the biggest crowd of the day, Miles was all smiles and bravado. All along the way, the crowd mushroomed to epic proportions, as if the staged theatrical event was part of some annual Christmas parade. We’re proud to announce a few good notes about the story. There’s indeed a happy ending. 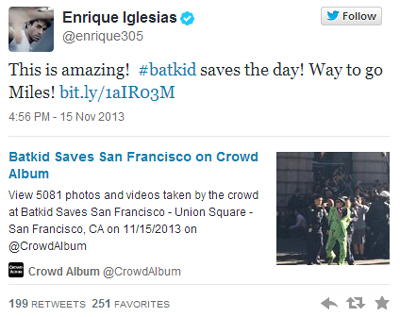 #Batkid finished his treatment in June and it’s said that his leukemia is now in remission. 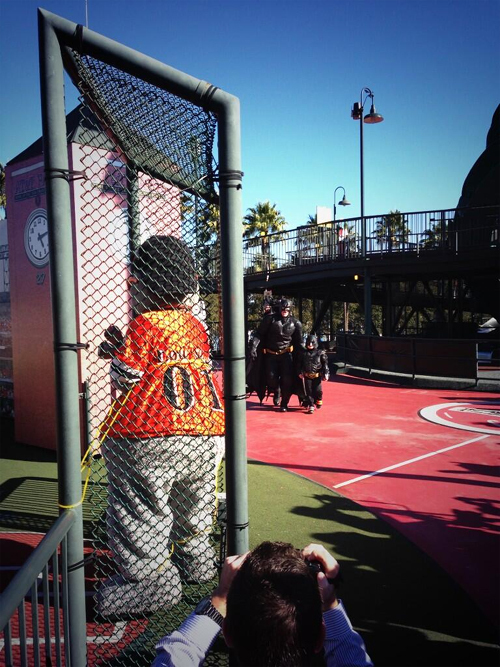 The young chap is too young to start up a Twitter handle, but whenever he’s ready #SFBatKid will be ready for him. But until then, “Bat Kid” may have put some superheroes out of business. Via Stephen Amell, the hot stud who plays the hunky Oliver Queen on the CW hit TV show Arrow.